Potli was recommended to us by a friend who runs her own restaurant in London and who couldn't speak highly enough of it, so we decided to catch up for dinner with our partners. That was our first visit (a couple of years ago) and we've been back twice since. That says a lot, since I don't usually like revisiting restaurants given there are so many to try out in London and new ones sprouting everyday! The food at Potli was excellent the first time we visited, just as good the second, but when we went last month (Dec 2015), the railway lamb curry which is my husband's favourite, made him look a little disappointed which was unusual because it usually has him sighing in glee. Before I talk about the food, a few words about the feel of the place. I like Potli because it's got a casual without being sloppy vibe. And little Indian touches to the decor, that make you feel you're back home. Many Indian restaurants adopt an Indian decor, but it tends to be either over-the-top or cliched. Potli feels authentic. Handprints on the wall, traditional masks, Indian paintings, a few movie posters, bunches of bangles, you get the picture... It's got elements of an Indian market, rather than trying to cram the entire country into one space. Service has always been friendly and the manager has always come over at the beginning or end of the meal for a quick chat, and that reminds me of home too. The whole getting-friendly-with-strangers business. Then the food. The menu is what it promises to be. Food from the famous food markets of India: Chowpatty, Chandni Chowk, Chowrenghee, Aminabad, Charminar and Fountain Chowk. There's pani puri, bhel puri, samosas with chole, tawa fish, kebabs and tikkas, biryanis, kulchas, naans and laccha parathas. And all very very delicious. The third time around, when it was six of us, we decided to order a vegetarian and a non-vegetarian platter for starters, so we could taste a bit of everything, and I highly recommend doing that. The non-veg platter especially, was outstanding. You get to sample sheekh kebab, tandoorichicken, chicken tikka done three ways, lamb chops, and tawafish. If a platter seems too ambitious because there are fewer of you, then try the tawa fish and the chicken tikka trio. The makkai piayzi and the samosa chaat are delicious too. 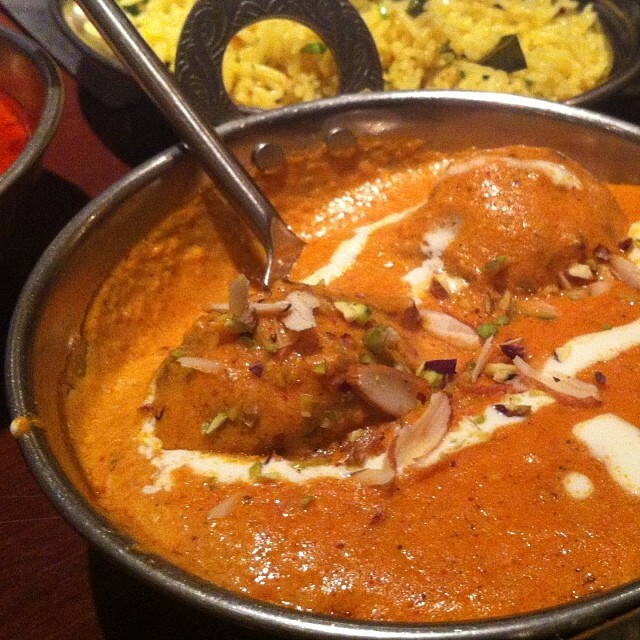 We've tried several mains at Potli, but are far from exhausting the menu. The mirchi ka salan and the rattan koftas stood out for me. From the meat and seafood section, the chicken handi masala was very tasty. I've got my eyes on the Goan prawn balchao and the chooza khas makhani for next time. There are two things I really like about the food at Potli: the first thing is that the dishes all look and taste different - this is such a welcome relief from your usual Indian restaurant in London where almost everything has been tossed in an onion, garlic and tomato base sauce. Everything we've eaten at Potli has had a very distinct and unique flavour. The second is that the menu is exciting. You don't usually see a mirchi ka salan or sikandari raan on the menu of an Indian restaurant in London. Potli restaurant is on King's Road in Hammersmith, so a very short walk from Ravenscourt Park station, or a slightly longer walk from Hammersmith station. I haven't been there for lunch, but definitely recommend dinner!